There are many different moves the New York Jets can make in free agency before the team begins training camp on Sunday. Rumors are swirling of strong mutual interest between the Jets and prized cornerback Nnamdi Asomugha. New York has also been linked to cornerbacks Drayton Florence and Jonathan Joseph, nose tackle Kevin Gregg and future Hall of Fame wide receiver Randy Moss. The Jets can also try to re-sign cornerback Antonio Cromartie and/or receivers Braylon Edwards and Brad Smith. However, no matter what the Jets do between now and the end of free agency, no move will be as important as the one New York just made in re-signing star receiver Santonio Holmes. Holmes’ contract with the Jets is for 5 years and $50 million, with $24 million guaranteed, the highest guarantee ever given to a wide receiver. The deal comes with plenty of risk, though. Holmes is just one strike away from being suspended for a full season because of two prior mishaps, one of which resulted in a four-game suspension at the beginning of last season, with the NFL’s substance-abuse policy. That being said, it is a risk the Jets had to take. Holmes’ speed and game-changing ability is matched by a select few receivers in the league. He has already developed chemistry and camaraderie with third-year quarterback Mark Sanchez. Most importantly, Holmes is Sanchez’s favorite playmaker and target, something that could have stunted Sanchez’s development had Holmes signed elsewhere. Holmes is often Sanchez’s first-look in the passing game, and always seems to respond by coming up with huge catches in the clutch, including two game-winning touchdown catches last year to beat the Cleveland Browns and Houston Texans. For a team that has been knocking on the door of the Super Bowl the past two seasons, Holmes also has a Super Bowl pedigree. He was named the Super Bowl XLIII MVP after making a tremendous touchdown catch, dragging both of his feet on the side of the endzone with only 35 seconds left to give the Pittsburgh Steelers a 27-23 victory over the Arizona Cardinals. 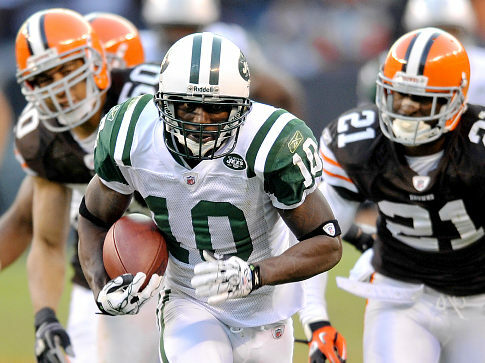 The New York Jets certainly made a big splash in a move they had to make, bringing Santonio Holmes back to the Meadowlands. Holmes’ playmaking ability brings so much to the Jets offense and he should help Sanchez continue to grow as a quarterback. New York is certainly not done in this hectic free agency period, as they have a variety of options with where to go next. 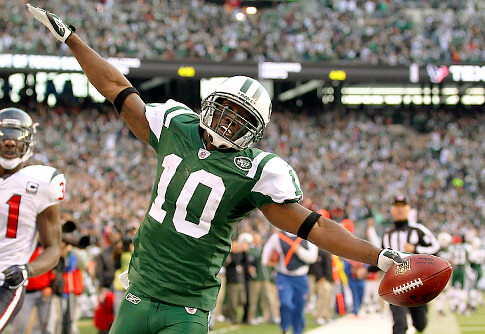 However, no matter what moves the Jets make between now and the beginning of training camp on Sunday, none will be as important as New York’s first one, re-signing Santonio Holmes. This entry was posted on July 27, 2011 by Scott Kornberg. It was filed under New York Jets, Santonio Holmes and was tagged with Jets, Mark Sanchez, New York Jets, Santonio Holmes, Scott Kornberg.